“Sama‘ ” discusses our musical heritage through comparison and analysis. This is this season’s last episode of AMAR’s show, after four consecutive years. Today, we will resume our discussion about qaṣīda “W-al-Lāhi lā astaṭī‘u ṣaddak wa-lā urīdu al-ḥayāta ba‘dak” written by Sheikh ‘Abd al-Lāh al-Shabrāwī. The recording of Abū ‘Ilā Muḥammad who is the first one who sang it. 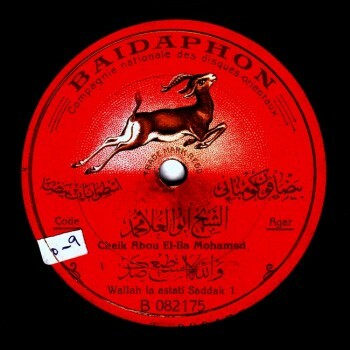 An imitation of Abū ‘Ilā Muḥammad’s recording by Sitt Fatḥiyya Aḥmad, made six or seven years later. We have discussed this in detail in our previous episode. We will mostly listen to Sheikh Abū ‘Ilā Muḥammad’s version first, followed by Sitt Fatḥiyya Aḥmad’s. He sang the second verse twice, saying “Yā qātil” instead of “Yā qātilī” the second time. I do not know if he had memorized the qaṣīda or if he was reading it. He must have been reading the qaṣīda as he had not memorised it… or had only memorised it partly so he kept the text in front of him. Sitt Fatḥiyya Aḥmad had memorised the qaṣīda and the melody perfectly. There is a beautiful bashraf to this tune recorded by Amīn al-Buzarī. Sitt Fatḥiyya Aḥmad sang it twice, just like Sheikh Abū al-‘Ilā Muḥammad. Let us listen and focus on “Yā qātil”, the second time, instead of “Yā qātilī”, just like Sheikh Abū al-‘Ilā. We must listen to it because it is Sitt Fatḥiyya Aḥmad’s first personal initiative, or added variation to Sheikh Abū al-‘Ilā Muḥammad’s version …. This is the initiative we mentioned: she extended the phrase. A beautiful variation to Sheikh Abū al-‘Ilā’s recorded version. The record of Sitt Fatḥiyya is a repetition/imitation of what Sheikh Abū al-‘Ilā sang, yet there is a difference between them –the same as in many other examples we talked about previously–: indeed, the printing of the record to the extent that even the translation/interpretation is not the same as Abū al-‘Ilā Muḥammad’s, but rather as if she were performing relaying to the muṭrib or the muṭriba a new verse or the next modulation. Which does not happen with Sitt Fatḥiyya who is expected to perform something new. We have analysed some examples, including “Arāka ‘aṣiyy al-dam‘i” and “Wa-ḥaqqika ant al-munā w-al-ṭalab”, where the translation/interpretation precedes the original –and they are mostly by Sheikh Abū al-‘Ilā. We have heard voices saying “Al-Lāh Sheikh Abū al-‘Ilā!” at the beginning and “Al-Lāh Quḍḍābī!” –the takht that included al-Quḍḍābī and Sāmī al-Shawwā, is the same takht that played six years later–. But there was no taṭyīb (praising) anymore as it was now considered by critics as a sign of being retrograde. Now people said “Bravo” instead of “Al-Lāh”, and attended concerts instead of “evenings” or “ḥafla-s”. We will talk about this some other time. Cutting a word with a breath is not appreciated in qaṣīda-s. Still, Sitt Fatḥiyya Aḥmad remains much better, in Arabic, than other muṭriba-s whose language skills were said to be great by critics. She was indeed much better, in Arabic, than most of her contemporaries, despite the linguistic mistakes we have mentioned, knowing that there are many others still. 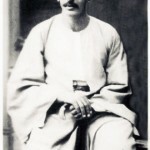 There is a gradual ascension in the maqām: starting from the ḥijāz aspect in the first verse –or Turkish jahārkāh if we stop at its qarār– that he affirms, then reaches the ṣabā jawāb –not the incomplete jawāb or the continuation of the ḥijāz aspect– or the muḥayyar if the ṣabā starts at the dūkāh, then concludes to the ṣabā’s fundamental position. Extending the “dā” is the language issue we were talking about. Sheikh Abū al-‘Ilā modulates to the jahārkāh from the sixth, that some name ‘ajam ‘ushayrān, which is better illustrated in Sitt Fatḥiyya Aḥmad’s version. The first remark that comes to the mind of the listeners is that Sitt Fatḥiyya sings the first hemistich “Jarra‘tanī al-hajra wa-huwa murrun” twice. Almost an Arpège… which indicates that al-Qaṣṣabgī’s style had started to spread. He either taught it to her, or it was an initiative on her part. This influence does not exist in the jahārkāh aspect. Thus I can say that Sheikh Abū al-‘Ilā Muḥammad sang a jahārkāh aspect from the maqām’s sixth, whereas she sang it to the Turkish Military fanfare’s ‘ajam ‘ushayrān, often found in the mihtār, and to which bashraf-s and samā‘ī-s were composed. It is a re-invented maqām from the 18th century or maybe the 19th. The ‘ajam ‘ushayrān is the major –not the piano’s equal temperaments– that will appear in the 1960s, or even before, with the accordion, the electric guitar, and the piano. Before Sheikh Abū al-‘Ilā Muḥammad’s discs, they had started recording with an orchestra including piano and flute that played equal temperaments while the singer did not. Anyway, we said that Sitt Fatḥiyya sang it to the ‘ajam ‘ushayrān, and that Sheikh Abū al-‘Ilā Muḥammad did not, but rather sang it to the Arabic jahārkāh temperaments –not Turkish jahārkāh temperaments that we have discussed earlier. Instead of the jahārkāh, he modulated to the ‘ushshāq from the maqām’s fourth, so the ṣabā’s incomplete fourth does not exist anymore. Then they translated for him, after which he concluded the side with the seventh verse: “Wa-laysa lī fī al-milāḥi” to the ṣabā. 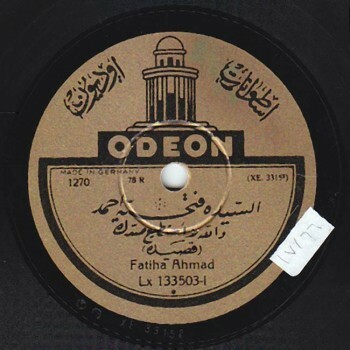 Let us talk about the technique of Sitt Fatḥiyya Aḥmad, knowing that by that time, they had become acquainted with recording and were not hindered by a record’s duration. Cylinder recordings came after that and thus their hard work and training had become vain as a recording’s duration was not limited anymore. The point is that when Sitt Fatḥiyya felt that the record was reaching its end, she concluded after modulating to the ‘ushshāq at the seventh verse “Wa-laysa lī” without any significant instrumental translation of the sixth verse. Both Sheikh Abū al-‘Ilā and Sitt Fatḥiyya concluded the first side with the seventh verse. She seems to be saying “ma’aladdak”. She had surely understood and comprehended the text, but sometimes the melody did not convey this, maybe because muṭriba-s had newly started to sing qaṣīda-s and were not used to this. Note that both Sheikhs and Afandī-s also had problems with the language, as we have mentioned in previous episodes. In Sheikh Abū al-‘Ilā Muḥammad’s version, it is clearly an improvisation. To those who analyse qaṣīda ‘ala l-waḥda, we say –as I have said in many conferences– that the issue of the waḥda rubā‘iyya changes from one baḥr to the other. Consequently, in such a simple and cheerful baḥr, i.e. mukhalla‘ basīṭ “mustaf‘ilun fā‘ilun fa‘ūlu”, the rhythm must be lively. The middle and the major waḥda are thus not to be considered. So they used the maqsūm because it is faster and livelier. So the baḥr determines the waḥda to which the qaṣīda will be interpreted. The waḥda rubā‘iyya can be a maqsūm. This point is to be added to the subject of the qaṣīda ‘ala l-waḥda. So she must have listened to “Shāraktanī fīka kulla ṣabbin”, but then went back to “Shārakanī fīka kullu ṣabbin” and mixed them up. In the eighth and the ninth verses, Sheikh Abū al-‘Ilā Muḥammad sings to the busalīk as we have mentioned earlier. If she had taken a breath between “yush” and “biha”, it would have been beautiful. “Wa-lastu yā badru artaḍī” and “Wa-yā ḥasbuk al-Lāh” are linked. It is a kawasht according to Ṣafyiddīn al-Urmawī’s categorisation. Until today, Sheikhs call this type of ṣabā “kawasht”. Now “Yā ghazālan”. Note that the kawasht requires a heightened fourth, not only to descend from the maqām (♩). Now, let us listen three times to “Kun kayfamā shi’ta yā ḥabībī”. We heard the full recording in our previous episode. As we heard, she repeated “Kun kayfamā shi’ta yā ḥabībī” three times, each more beautiful that the last, and each time she ascended, performed jawāb, and sang clear and brilliant notes. Let us listen to the last verse in the voice of Sheikh Abū al-‘ilā who sang “Wa-hjur idhā shi’t” twice to the ṣabā’s first jins. Then he concluded, they translated for him, and he sang marvellous layālī to the ṣabā, accompanied by the qānūn and the violin. Sitt Fatḥiyya did not do the same because recording did not require them to remove what critics had started to consider as defaults, such as the layālī they used to end records with, and that they also certainly sang in ḥafla-s, as they certainly were not created for the sole purposed of filling space in the records. As we heard Sitt Fatḥiyya’s full recording last time, let us now listen to the full recording of Sheikh Abū al-‘Ilā. Note the beautiful faithful –not memorised– translation by ‘Abd al-‘Ḥamīd al-Quḍḍābī and Sāmī al-Shawwā, even though they were supposed to imitate the recording of Sheikh Abū al-‘Ilā. They knew that Sitt Fatḥiyya had taken the initiative to vary, and did not know when she would improvise, so they had to translate without relying on their memory. Every time we presented a personal conclusion, we mentioned it was personal and never claimed it was confirmed information. Every time we presented confirmed information, we documented it, and even travelled just to obtain information to offer listeners and students. There were certainly mistakes… Great scientists, whatever their field of study, were confronted to mistakes… which is natural and human. Still, we apologise for any mistake in any of our episodes throughout these four years. We will meet again in a new episode in our next season of AMAR’s show.